See Jane. : "Kiss my Grids"
I was out of power until Thursday due to Irene (and a huge tree falling on the power lines ripping the lines right off of our house) so I made 2 area rugs out of old t-shirts and started in on a baby present for a little one who will be joining our world next Wednesday, in less he decides to come out sooner. This is the baby present so far, I incorporated this week's challenge, Kiss My Grids, by using only grid patterns for the background. The lighting wasn't great, and I'm too tired to fix it. Bedtime for Bonzo. 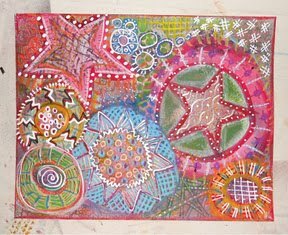 I hope little Parker Anthony will like it. Love the tangle. Such a thoughtful gift! Would love to hear more about the tee shirt area rugs. You know those pot holders we made as kids? 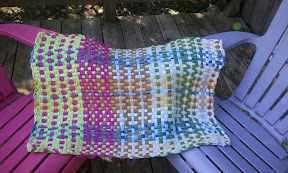 Same concept but using a bigger loom. T-shirts were cut in 1 1/2" strips starting at the bottom hem, getting 7-10 strips(loops) per shirt. Love your t-shirt rug, the loom must be quite large. 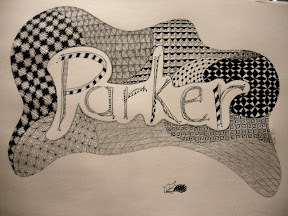 Parker (or should I say Parker's parents) will love his very own Zentangle. Your lettering is lovely, free and fun. Glad your okay after the storm!